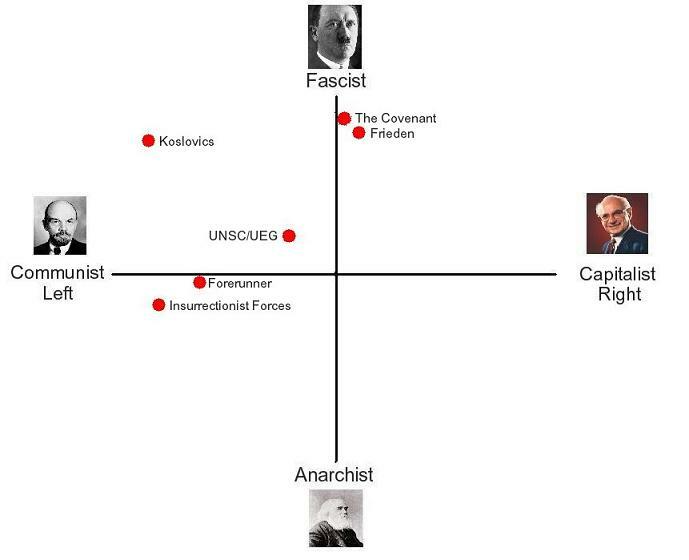 Note: Position charts used in this article are © Political Compass. Most Halo fans have diverging opinions on the political behavior of certain groups in Halo fiction. Because of the fact that humanity is engaged in a bitter war with the fanatic Covenant, popular opinion usually drifts towards the thesis that the UNSC (and UEG) are fascist and extremely authoritarian - the next worst thing to the types of fascism we've seen during World War II. As much as some evidence in Halo canon supports that assumption, current-day social and economic political parameters do not. While I'm aware of the fact that these assumptions are generally made by people who simply want to enjoy Halo fiction disregarding larger, more complex elements within it, they've grown to the point where they've become stereotypes which simply aren't entirely accurate. 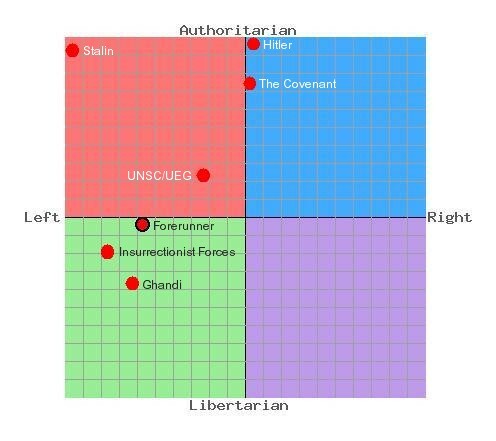 That's why I headed to the Political Compass (a quiz that tells you where you stand politically) and filled in the propositions with what I thought most closely resemble the UNSC/UEG's and the Covenant's policies in Halo fiction. - Economically, the UNSC/UEG is a semi-collectivist society, restricting the development of large-scale monopolies but not restricting private property and private initiative and the free market. - Socially, while advocating a strong government and military, the UNSC/UEG doesn't intervene in the basic social aspects of its citizens the way fascist authoritarians might. The UNSC/UEG takes on a moderate stance on criminal punishment in respect to civilians, while occupying an extremely authoritarian position towards UNSC military personnel (death punishment is allowed in case the Cole Protocol isn't followed to the letter, for instance). - Economically, the Covenant respects basic free market doctrines: the existence of private enterprises separate from the military and statist wings, especially supporting the higher aristocratic economy. - Socially, the Covenant holds a much more extreme and authoritarian stance than the UNSC. Its fanatic religiousness, coupled with extreme social intervention on the part of the Prophets and higher military class, drastically restrict free will, freedom of speech, and possibly, freedom of whatever the Covenant version of the press would be. Its extreme stance functions both toward non-military and military personnel. The Left: Advocates a state-controlled and collectivist (socialist) economy based on public ownership of the means of production and manufacturing and industrial corporations. The Left intensely regulates economic growth in order to adjust to society's needs as a whole. The Right: Advocates private ownership of the means of production and free markets (economic liberalism). The Right generally does not tolerate state and government intervention and regulation of the economy. Now that those annoying explanations are out of the way, you can proceed to the core of my undertaking: the UNSC/UEG and Covenant's position on social and economic matters. 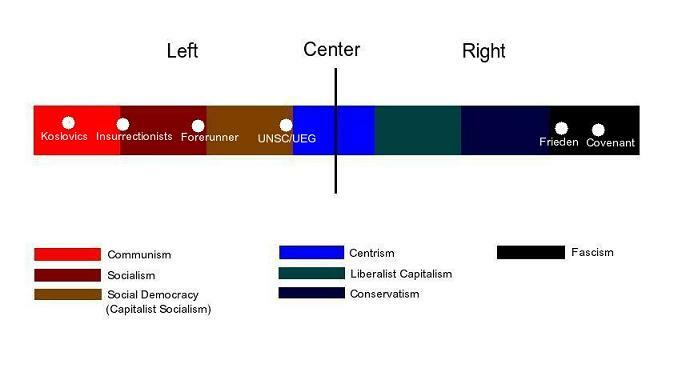 Note: the horizontal Left-Right line defines the economic position (far left: communism, far right: extreme liberalism), while the vertical line defines the social position (libertarianism: anarchism, authoritarianism: fascism). Interesting, isn't it? The UNSC/UEG is placed on the center-left, with a barely noticeable authoritarian marking. Does the result correctly reflect my understanding of the UNSC/UEG's political functions before I took the quiz? I think it does: the UNSC is moderately collectivist, practicing only minor social intervention towards civilians. Hardly a fascist attitude! Hitler's fascism is all the way up there. Of course, during the Human-Covenant War, the UNSC's position may change - like being pushed a bit further up the authoritarian scale and a bit further to the left. Hitler and the Prophets sharing the same general ideology? That's nuts! Wait, not it's not. Think it through for a minute: Hitler's Nazism advocated a strong religious identity in his early days - so does the Covenant. Hitler was an avid anti-pacifist - the Covenant is practically completely militarist in nature, going so far as to ignore civil freedoms entirely. Fascism encourages social differences and the so-called "Fuhrerprinzip" - the Covenant contains masters and slaves, in the most straightforwardly sense, where the masters are encouraged to beat their slaves if they don't work up to their expectations. That's hierarchal violence, something Mussolini, if my historical knowledge serves me right, was nuts about. So you were saying the UNSC was fascist? Take a look at that picture one more time and assess the political environment. It certainly looks like they're pushing towards a form of less radical communism on the far left. However, their position is anything but accurate with such little information in canon. There's not that much of a difference between the UNSC and the Insurrectionists, neither economic nor social. They're still waging war on each other, though. The next faction I've approached is the Forerunner. Although next to nothing is known about the Forerunners' social and economic aspects, their dedication to a strong military and a very organized structure, combined with their apparent democratic lifestyle in the military, gives them an almost socialist appearance. Again, those are simply my ideas of what the Forerunners are like - the result may or may not please you. Finally, I've put together a chart only containing the most important factions in Halo fiction, excluding real-life figures (I instead put up pictures of them in their respective areas) based on the results I got in the Political Compass test. The Koslovics and the Friedens' positions are ENTIRELY speculative, however, following the train of thought that after 150 years since the fall of the Soviet Union, communism took a slightly less radical form leading to "neo-communism." Likewise, the neo-fascist Frieden may have likely relaxed its authoritarian position, and moved slightly more to the right, thus allowing more economic freedom than old fascism did. The opposing thesis - that neo-communism and neo-fascism are actually revolutions aimed to recreate the original doctrines of communism and fascism - is very plausible, but I found the first theory is more likely to represent the true evolution of the two ideologies. To aid your understanding of the political positioning, I've put together a one-dimensional left-right axis of political ideologies together with the rough position of the factions in Halo based on the results in the Political Compass test. Most of the right in the Halo universe is empty; the far-right, however, with its more collective nature, still seems to appeal to some factions. All these examinations, however, are based on my OWN understanding of the Covenant, the UNSC and other factions. Anyone can take the quiz at the Political Compass; so if you're not convinced the results I received are accurate, I encourage you to take the quiz yourself and attempt to retrace my steps. All you need is a decent understanding of Halo canon and its backstory. If you have any questions regarding this page, please email us. Position charts used in this article are © Political Compass. Article written by UNSC Trooper.